Tsunami Strike! Pacific Edition is a scenario-based learning experience for kids from middle school through high school (approximate ages 13-17). The scenario tells the story of four main characters at different locations in the Pacific basin who are each impacted by a major tsunami that originates in Alaska’s Aleutian Islands. Over the course of the story, learners not only view the unfolding events and how each of the characters responds, but also observe how warning scientists analyze and communicate the tsunami threat. Fourteen short lessons provide interactive instruction focused on the science, safety, and history of tsunamis. 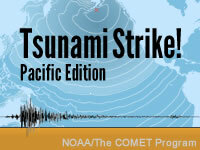 The module includes a Teacher's Guide and other Resources for Teachers that provide ideas on how to use Tsunami Strike! in the classroom. This is most informative and very easy to use and understand. I recommend this to any one living on the coast and in a Tsunami prone area. Or if you are just interested in how tsunamis start and work. Students will understand the basic physics of water waves (wave height, depth, amplitude, and speed) and how tsunamis represent a special type of water wave. Students will be able to calculate or predict (the increase or decrease in) one property of a wave from its other properties. Students will be able to describe the effects of bathymetric features on wave angle and speed (refraction, reflection, shoaling). Students will be able to make a basic calculation of the force in a tsunami wave and state how that relates to other more common forces they may be familiar with. Students will be able to describe the types of seismic and other events that can generate tsunamis. Students will have a basic knowledge of the earth's major plates and their locations, and understand why some faults zones are more likely generate tsunamis. Students will be able to recognize the natural signs of an impending tsunami at a coast. Students will be able to describe how tsunami warnings are disseminated by national and local agencies. Students will be able to determine the best tsunami evacuation locations given geographic and urban information. Students will be able to state locations and basic facts about several significant tsunamis that occurred between 1900 and 2011. Students will be able to relate the basic elements of several legends reflecting devastating tsunamis in ancient and pre-literate times. Students will increase their knowledge of many geographic locations by connecting them to historic tsunamis. Students will be able to describe the various technologies and systems involved in seismic monitoring and issuing tsunami warnings. Students will be able to describe community and personal preparedness measures that can be taken for potential tsunamis. December 2017: This lesson update addresses changes in areas of responsibility of the National Tsunami Warning Center and Pacific Tsunami Warning Center. May 2014: In October 2013, the West Coast/Alaska Tsunami Warning was renamed the National Tsunami Warning Center. This lesson currently reflects the previous name.